Carefully hand crafted Mango wood & carved detailing, give a distinctive and elegant look. A collection of 14 pieces to choose from you can create your own combination. An art deco, simplistic style, with a hint of gold design to give a unique flare to the furniture. Solid oak produced from 100% European Oak with a mid-tone finish applied. The Nixon collection has bundles of rustic character with a natural finish. 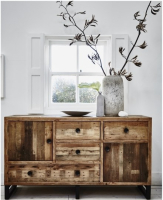 Made from reclaimed materials, the pieces make a life-style statement in any home. The mix of smoke oak and chrome will bring a fresh modern feel to any dining room. A mixture of contemporary and classic design. Hand finished. 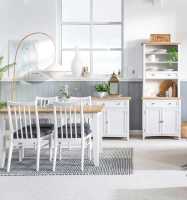 Relaxed and casual range combining real oak veneered tops with beautifully painted soft white bodies.